Corporate social responsibility has become a heavily discussed topic in business ethics. 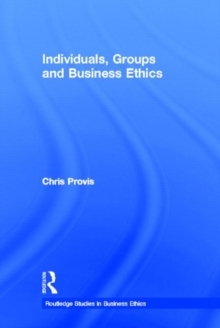 Identifying some generally accepted moral principles as a basis for discussion, Individuals, Groups, and Business Ethics examines ethical dimensions of our relationships with families, friends and workmates, the extent to which we have obligations as members of teams and communities, and how far ethics may ground our commitments to organisations and countries. It offers an innovative analysis that differentiates amongst our genuine ethical obligations to individuals, counterfeit obligations to identity groups, and complex role-based obligations in organised groups. It suggests that often individuals need intuitive moral judgment developed by experience, reflection and dialogue to identify the individual obligations that emerge for them in complex group situations. These situations include some where people have to discern what their organisations' corporate social responsibilities imply for them as individuals, and other situations where individuals have to deal with conflicts amongst their obligations or with efforts by other people to exploit them. This book gives an integrated, analytical account of how our obligations are grounded, provides a major theoretical case study of such ethical processes in action, and then considers some extended implications.